This is the first recorded miracle of Jesus Christ in the four gospel accounts, this miracle is special and I will show you why. There were six stone waterpots that happened to be there, which would have been in any Jewish household, because these pots were used for cleaning, so there was nothing extraordinary about the waterpots themselves. But that is what God always does; He takes the ordinary, and does the extraordinary. He did with these waterpots what He did with the Apostles, twelve ordinary men, He set out into the world, that set the world on fire, and nothing has been the same since. He took six ordinary stone waterpots and did something extraordinary, and what He did was something only God could do, He created. Do you want to be used by God? Do you want to take part in His kingdom? Then obey Him, and you will. The servants mentioned here we know little about, but we do know that they obeyed the commands of our Lord Jesus Christ. Jesus said, “Fill the waterpots with water.” And the scripture tells us, “And they filled them to the brim.” Jesus said to them, “Draw some out now, and take it to the master of the feast.” And the scripture tells us, “and they took it.” These servants were obedient in following the commands of Jesus Christ and they got something special for that, they witnessed the God of creation doing something only He can do. Create matter! That is correct, this miracle is special because it is a miracle of creation, Jesus created. Man cannot create, only God can create. We, man can take matter and reshape it to look different. We can take basic elements (atoms) and through a series of chemical reactions bind those atoms to other atoms or separate atoms making a different compound, but we always have to start with the matter we are given we can never make new matter (new elements). 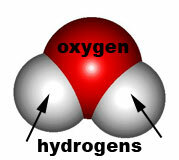 Jesus said to the servants, “Fill the waterpots with water.” And the scripture tells us that “they filled them to the brim.” Water is made up of two elements, Hydrogen and Oxygen, you must have these two elements to have water, and there must be two parts Hydrogen for every one part Oxygen, thus the Chemical symbol (H2O). Wine occurs when you extract the juice from grapes and allow that juice to ferment. Fruit has a sugar called fructose, which is a carbohydrate. All carbohydrates (which there are many combinations of) have three parts in common; all most have these three elements: Carbon, Hydrogen, and Oxygen. The compound fructose which is the bases for making wine is six parts Carbon, twelve parts Hydrogen, and Six parts Oxygen, (C6H12O6 ) . So therefore, in order for the water that was filling these waterpots to become wine, the element Carbon had to be added. This miracle is a miracle of creation. In doing this miracle Jesus performed the miracle of creation in creating within these waterpots the basic element Carbon, which was not previously in the waterpots. Six carbons, combining with six water molecules, making the compound fructose, which then could be turned into wine; this my friends was a miracle of creation. In this miracle, Jesus Christ proved that He was the creator God, just as we had learned through our study of chapter one. The scripture tells us “the master of the feast tasted the water that was made wine.” He told the bridegroom in so many words that this wine was much better than the wine that was previously set out. On this earth that God created, there are some things that are just incredible to our taste buds. Can you imagine how great this wine most have been? There are a couple of things I have taken out of this miracle and here they are. 1. Jesus is the creator God, who became as His creation, a man so that He could walk among us and with His first miracle that He performed before men established that as fact. 2. If you want to see God working, if you want to take part in what God is doing, then obey the commands of Jesus Christ. Jesus said, “Go into all the world and preach the gospel to every creature.” ~Mark 16:15. He didn’t say try to get people to come into the church or change the gospel to try to win people’s hearts. He said preach the gospel, His gospel. Man is sinful, and Jesus paid it all, so repent and put your faith in Jesus Christ alone.